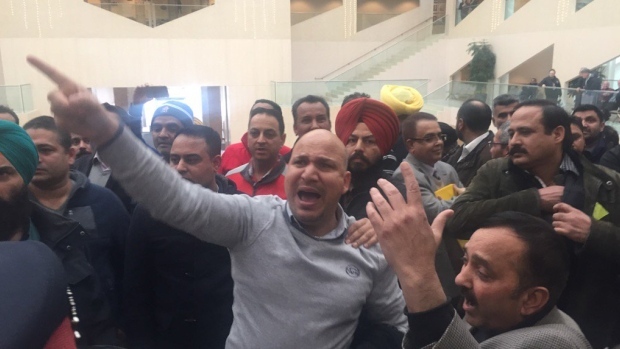 This afternoon, Edmonton City council chambers were cleared as taxi drivers started chanting “shame, shame” in the debate against Uber. The outburst among the taxi drivers started after council voted down on a motion to postpone the debate until after the Ward 12 by-election is held on February 22. Dozens of taxi drivers backed the council chambers after holding a rally outside. Mayor Don Iveson urged drivers to allow council to debate the proposals. When order in council chambers could not be restored, the chambers were cleared and all members of the public and media to leave. The meeting resumed after 3 p.m. with only members of the media, city staff and councillors inside. Uber representatives and taxi drivers were asked to remain outside. Councillors are looking at recommendations that could make Edmonton the first Canadian city to legalize Uber. In a report, administration recommends the city deregulate taxi fares for pre-arranged trips to allow taxis to compete with Uber. Council has been trying to deal with Uber ever since it started operating in Edmonton just over a year ago. The ride-sharing company says the bylaw doesn’t apply because Uber is a technology company, not a transportation company. The report also recommends the city should charge a licensing fee to Uber, instead of charging the individual drivers. Uber drivers will have to carry commercial vehicle insurance.